All breast implants are not created equal. The implants you choose for your Maryland cosmetic surgery will not only determine your aesthetic outcome, they will determine how likely you are to need revision surgery in the future. Dr. Ronald Schuster, a board-certified plastic surgeon in Lutherville, tells us about the latest innovation in breast implants and what it means for women. Throughout Dr. Schuster’s distinguished career, he has sought to educate his patients so they can make the best choices for their bodies. He is proud to be one of the exclusive surgeons in the Baltimore area to offer the IDEAL IMPLANT® Structured Breast Implant. What is the IDEAL IMPLANT® Structured Breast Implant? The internal structure of the IDEAL IMPLANT is what sets it apart. With two chambers and layers of baffled shells, the IDEAL IMPLANT is able to control the flow of saline inside the implant. The result is a breast implant that moves and feels more like natural breast tissue. To learn more about the unique structure of the IDEAL IMPLANT visit idealimplant.com/overview. The IDEAL IMPLANT is also manufactured with lowered edges so it naturally contours to the chest wall. Visit Dr. Schuster’s office to see a side by side comparison of the IDEAL IMPLANT Structured Breast Implant, a saline breast implant, and a silicone gel breast implant. Many women find that in a blind feel test they cannot tell the difference between a silicone gel breast implant and an IDEAL IMPLANT Structured Breast Implant. The FDA categorizes breast implants as temporary devices, and notes that “the longer you have breast implants, the more likely it is that complications will occur and you will need to have them removed.” Breast implant rupture is one of the most common complications, and necessitates a revision surgery. Choosing breast implants with a low rate of complications like rupture will help you avoid additional surgeries. Some surgeons recommend replacing your breast implants periodically, even if there is nothing wrong with them. However, Dr. Schuster tells us, “you only really need to replace them if they break. So with the silicone gel implants, the rupture rate ranges between 10% and 25% over 10 years, it’s significant. With the IDEAL IMPLANT, it’s a lower rupture rate.” In fact, according to recently released data from its FDA clinical trial, IDEAL IMPLANT Structured Breast Implants showed a rupture rate of only 2.1% in an eight-year study of primary augmentations. Dr. Schuster contrasts this with silicone gel breast implants. “With the silicone gel implant, it stays inside the body. And so, we call that a silent rupture, because the women will not know about it.” Some surgeons downplay the anxiety a silent rupture can cause their patients. However, a recent survey found that 98% of women stated they would be somewhat to constantly concerned about a silent rupture with silicone gel breast implants. Dr. Schuster recognizes that his Maryland cosmetic surgery patients want not only great looking results, but freedom from anxiety about the status of their implants. Board-Certification: Make sure your plastic surgeon is board-certified by the American Board of Plastic Surgery. Surgeons who maintain their board-certification demonstrate a higher level of patient care, ethics, and education. They have undergone rigorous training and testing in order to provide their patients with safe and efficient procedures. Education and Experience: Find out where your surgeon trained, and what type of experience they have. Make sure your surgeon has experience in the procedures you want. Before and After Pictures: Ask to see your surgeon’s before and after pictures. Not only will this give you an idea of the surgeon’s skill level, it will help you understand the type of results you can expect. Schedule a Consultation: One of the best ways to pick a surgeon is to visit the office for a consultation. Sitting down face to face will help you decide if you are comfortable with the surgeon and their office. Your Maryland cosmetic surgery should be performed by someone with experience, skill, and compassion. Your surgeon should be in tune with your desired results, and always be honest about what plastic surgery can and cannot accomplish. Dr. Ronald Schuster is a board-certified plastic surgeon, the Chief of the Plastic Surgery Division at Northwest Hospital Center, and head of his private practice. He is a graduate of Emory University and received his medical degree at the University of Maryland School of Medicine. After a five-year general surgery residency at Sinai Hospital, Dr. Schuster completed a three-year residency and fellowship in plastic surgery at Washington University Barnes Hospital. His extensive training allowed him to become familiar with the procedures he now performs regularly. Dr. Schuster is a member of several prestigious medical organizations, including the American Society of Plastic Surgeons, the American Society for Aesthetic Plastic Surgery, the American Medical Association, and the American Society for Laser Medicine and Surgery. 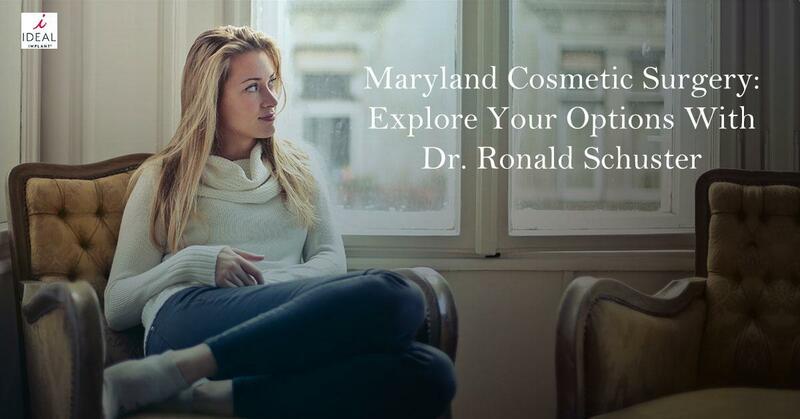 If you’re curious about Maryland cosmetic surgery, schedule a consultation with Dr. Schuster. He has the experience, skill, and compassion you need to get the results you want. He is also one of the exclusive surgeons in the Baltimore area to offer the IDEAL IMPLANT Structured Breast Implant. Dr. Schuster believes every woman has the right to beautiful results with peace of mind. He will provide you with all the options and information you need to make the best decision for your body. Considering breast implants in Lutherville? Contact Dr. Ronald Schuster today to discuss your options. Simply call (410) 902-9800, or visit www.cosmeticsurgerybaltimore.com. Dr. Schuster’s office is located at 10807 Falls Road #101, Lutherville, MD 21093. Call today for more information on IDEAL IMPLANT® Structured Breast Implants.